Wes Anderson brings his unique style and sensibility to his second foray into stop-motion animation, a love letter to Japanese film about a city that banishes its dogs to an island wasteland. 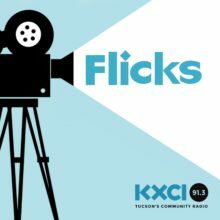 I’ve remarked more than once, here on the show, on the unique qualities that director Wes Anderson brings to his films. He has a visual style which is instantly recognizable as his alone: intricate toy-like sets, horizontal patterns, bold colors, and a love for small details. All of this is coupled with a gentle, quirky sense of humor; an essentially generous point of view on people, tempered with an awareness of the darker sides of our humanity. Naturally this would lend itself to the animated film form. He did that with the stop-motion animated Fantastic Mr. Fox back in 2009, and now he’s ventured into the same territory with his new film, Isle of Dogs. Anderson wrote the screenplay for Isle of Dogs, and here he indulges his love for anime, and in fact for Japanese film in general. The story takes place in a near future in which the mayor of a city in Japan uses an outbreak of canine flu as an excuse to banish all the dogs in that city to a place called Trash Island, where, for decades, garbage and toxic refuse has been dumped. The real motive is that the mayor, a cat lover, has a grudge against dogs because of a rivalry with an ancient family that were dog lovers. The first dog sent to Trash Island happens to belong to the mayor’s own adopted ward, a boy named Atari. Atari steals a plane and flies to Trash Island to find his lost dog, and in the process teams up with five island dogs who decide to help him. Typically for an Anderson film, there are several subplots, including a dog-loving resistance group led by a foreign exchange student, and a scheme to replace pet canines with a race of robot dogs. The visual design is amazing. The eerie expanses of Trash Island, the contrasting beauty of the nearby city, and the sophisticated expressiveness of the dogs themselves, are such a marvel that one ends up settling in to a complete sense of wonder. As with the Mr. Fox film, this is stop-and-go animation using small puppets, and it’s rather daunting the amount of time and effort it took to construct something this delicately complex. The story touches on some heavy themes—the threat of extermination against the dogs echoes the human dilemmas of war and genocide; and Atari and the other idealistic characters are confronting cruelty with heroism and love. In the screening I attended, parents had brought quite a few small children. There’s nothing I would call traumatizing in the movie—the picture maintains a light humorous touch throughout—but at the same time I’d have to say that this film is way over the heads of kids that age. Ten years old or over may appreciate it better, as well as adults, of course. The screenplay is very funny, and Anderson always includes actors he has used before, as a sort of stock company. In this case, the voices of Edward Norton, Bob Balaban, Bill Murray, and Jeff Goldblum as four of the five dog companions, as well as Tilda Swinton and Harvey Keitel in other dog roles. Anderson also puts the spotlight on new members of his troupe. In this film we have Bryan Cranston in the biggest part—he’s wonderful as a tough stray dog who is understandably suspicious of humans; and Liev Schreiber as Spots, the first dog on the island whom Atari has come to rescue. All the dogs speak English in the film, along with the exchange student (Greta Gerwig) and a translator (Frances McDormand). The rest of the human characters speak Japanese, sometimes translated but often not, and that turns out to be a charming device, since those of us who don’t know the language are put in the same position as the dogs, who don’t know what Atari is saying to them, but manage to catch the drift anyway. Not everyone likes Wes Anderson. I, however, really love his movies, and I’ve seen every single one. This one has a satisfying balance of laughter and delight with a feeling of sadness about our all-too-human flaws, reflected here in our relationships to dogs. The name of the film is Isle of Dogs. If you say it fast it also sounds like “I love dogs.” And I’m pretty sure that was intentional.